By now, anyone who has listened to a weather report in the last couple of weeks knows that since December this has been one of the warmest winters on record. Tuesday was technically the first day of spring, but it seems that here on the Island, spring began to arrive about two to three weeks ago. The painted turtles in my pond thought so. The first ones emerged on March 15, which is nearly three weeks earlier than at any time since 2004. And on March 19 a cabbage white butterfly was at Tisbury Meadow. While this species first emerged on the mainland in warm weather a couple of weeks ago, this is one of the earliest appearances known for Martha’s Vineyard. As will be seen from the bird notes below, the unusually warm early season has already had an impact on several species that typically winter here. Some have already started to begin their northward spring movement and have begun to disappear from areas where they have been since late November. Others have arrived here in greater numbers than usual, and more early arrivals can be expected. A few years ago both prothonotary and Kentucky warblers appeared before the end of March. Frequently, indigo buntings turn up, usually at feeders, by the same time, and more rarely summer tanagers or rose-breasted grosbeaks have reached here by then. One year a northern parula warbler and a ruby-throated hummingbird arrived before the end of March. It is thought that most of these birds get caught up in weather systems that contain brisk southwest winds, and end up being carried farther north than would normally be the case. In most instances, they usually do not remain here long because there are no leaves on the trees and not enough of their preferred natural food to eat yet. Given the longer-term weather forecast for the next week or so, it would not be especially surprising for such a pattern to occur again. So we should all be on the lookout and keep our bird feeders well stocked. There has been a lot of activity among the waterfowl. Jeffrey Bernier noted 15 double-crested cormorants already at the nesting site on Sarson’s Island on March 19. Most Canada geese have now paired up and the larger flocks are starting to disperse. The great majority of the flocks of the three species of scoters that typically winter off Gay Head, Pilot’s Landing and Squibnocket Point have dwindled down to only a few dozen. There were still about 80 brant in Ocean Park in Oak Bluffs on March 15, but most of them will probably start north by April at the latest. A few lesser scaup are still in Squibnocket Pond, and Lanny McDowell found 52 greater scaup in Edgartown Great Pond on March 19. Most of the hooded mergansers that were in Squibnocket and Farm Ponds have left, but a few green-winged teal have arrived at places where they were not found on the Christmas Count. 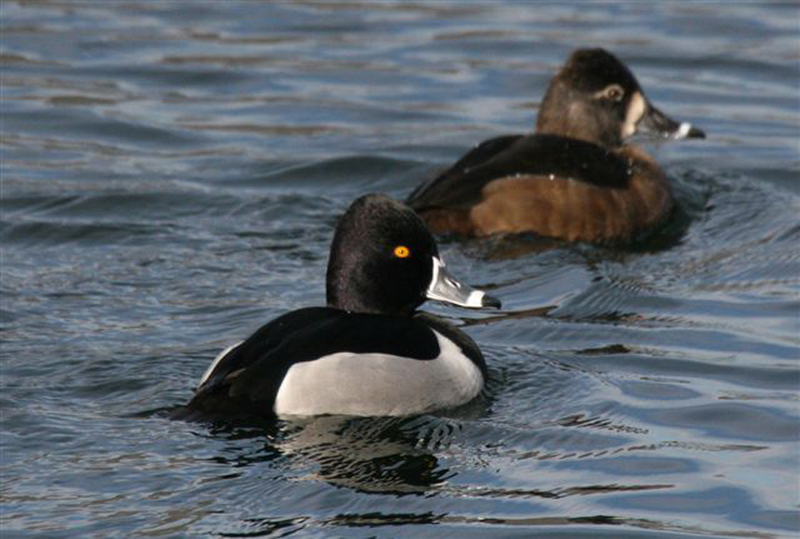 There seem to be more handsome ring-necked ducks around than there were earlier; 18 were at Cranberry Acres Pond on the March 19, a pair has been at the Keith Farm since March 13, and some were found in one of the water holes on Farm Neck Golf Club. On the ocean, common loons are now being greatly outnumbered by red-throated loons. Lanny McDowell found 130 red-throats at once off the south shore on March 18. This is somewhat early for such peak numbers, and this is one of the highest single-site counts ever. But the real prize was a Pacific loon found off Pilot’s Landing by Bob Shriber on March 11. There are a handful of previous Island records, and this species has usually been found somewhere in eastern Massachusetts every year recently, but it is still very much a rarity here. The same day Bob counted about 750 razorbills heading west out of Vineyard Sound from Gay Head, the second highest single-day count on record. Horned grebes are also staging on the ocean all around the Island, some of them already in handsome spring breeding plumage. This is also about the peak time for their numbers here; counts of up to 40 or more at a time are not unusual. As for shorebirds, Bob Weaver found the first piping plover at James Pond on March 9. Richard Berkley saw three pairs of American oystercatchers along the beaches at Chappaquiddick on March 17. General arrival of killdeer was just about on time in mid-month; one at Keith Farm March 14, two at Farm Institute the next day, and three in Chilmark by March 17. Most remarkable were the photos taken by Jean-Marc Dupon in Chilmark of a hen woodcock already with four chicks by March 14. This is by far the earliest documented record of woodcock breeding for the Island and probably for the state. Veit and Petersen’s Birds of Massachusetts does not even provide egg dates earlier than April 16. A few Wilson’s snipe are passing through about now; two were in Chilmark March 19. The big news among land birds is still the fish crows commuting each night from the Cape. Most evenings about 6 p.m. they can be seen flying west toward Longview from the entrance to the Hoft Farm road on Lambert’s Cove Road, usually in mixed groups with common crows but easily distinguished by their smaller size as well as their voice. On March 17, David Stanwood and Lanny McDowell tracked down the roost not far from the Lambert’s Cove Inn. They estimated at least 100 fish crows, and possibly more, which were roosting together slightly separately from the American crows in the same area. It will be interesting to see how long the communal roost continues before the birds break up into pairs to nest. Most of the wintering yellow-rumped warblers have left, and migrant flocks of robins have arrived. Over 100 robins were in the Farm Institute fields on March 15. It is in spring flocks such as these that one should look for the Newfoundland race, which has a solid black back as dark as the head, all the way down to the base of the tail. Phoebes are now widespread on the Island, and the first tree swallows arrived on March 19, some found by Matt Pelikan at the Hoft Farm and two at the pond near the state forest headquarters. Steve and Happy Spongberg enjoyed a flock of cedar waxwings at their home on March 16; these nomads can appear almost anywhere at any time of year. Jeffrey Bernier reports four singing horned larks on the dunes opposite Sengekontacket Pond on March 19. The next few weeks will be among the most exciting all year for Island birders because almost anything can turn up. There are already suggestions of a good spring migration, which will not get into full swing until late April and May, but with our recent weather that seems just around the corner. Please report your bird sightings to the Martha’s Vineyard Bird Hotline at 508-645-2913 or e-mail to birds@mvgazette.com. Allan Keith is a naturalist living in Chilmark and coauthor of Island Life: A Catalogue of the Biodiversity on and around Martha’s Vineyard.